How were Ned Kelly’s bones finally identified? What makes cockroaches some of the most successful creatures on the planet? Could some obscure bacteria finally rid the world of dengue fever? How did infant reflux become the disease of the moment? Why does the discovery of a planet made of one huge diamond cause so much media excitement? And do video games really rot children’s brains? From the furthest reaches of the universe to the microscopic world of our genes, science offers writers the kind of scope other subjects simply can’t match. Good writing about science can be moving, funny, exhilarating or poetic, but it will always be honest and rigorous about the research that underlies it. 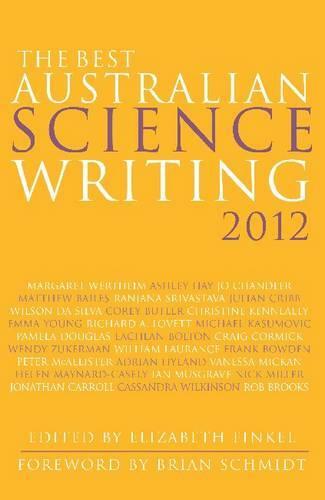 Editor Elizabeth Finkel showcases the nation’s best science writing, drawn from some of this country’s best publications. With a foreword by Nobel Prize-winning astronomer Professor Brian Schmidt, the anthology includes contributions from Margaret Wertheim, Ashley Hay, Wilson da Silva, Jo Chandler and a host of new voices.